Pet training is often associated with the more traditional animals that we keep at home. It means that when the topic of training your bird is breached, there can sometimes be several raised eyebrows. However, with a little persistence, bird training is possible. Like a lot of animals, the trick is observation and imitation, meaning that those owners who invest time in their bird will reap the rewards. Following on from the above, let’s take a look at some ways you can train your bird, as well as looking at the specific tricks that you can teach them. How should you train your bird? In truth, there’s no definitive guide to training your bird. In fact, as you’ll see shortly, there are different steps required for each trick. As a general rule, you should aim to follow the tips below if you want to succeed in training your bird. Don’t reward bad behavior – This obvious tip is something that is applicable to every pet and human in the land. You have to make sure that all good behavior is rewarded accordingly, and anything untoward is ignored. Be strategic with your training locations – Be shrewd with your training locations and don’t try teaching in places where there are lots of loud noises. Training should be a calm and unintimidating experience for your bird and if you are placing him in an environment which he isn’t completely comfortable in, the results aren’t going to be as positive. On a similar topic, always make sure you stick to the same training location so your bird is familiar with the practice. Choose your moment – There will be times when your bird just doesn’t want to learn. Now isn’t the time to push them, it’s time to give up. Put him back in his cage for 10-15 minutes and then try again. Never raise your voice – Unlike humans, a bird won’t recognize shouting as a correcting action. It means that they will get confused and suffice to say, this isn’t the result you want to have during training. Naturally, this first trick is going to be easier to achieve with some birds more than others. Parrots certainly fall into this category and if you happen to have one, you’re in good standing. Nevertheless, it is going to be difficult regardless. Here are the steps you should follow. Make sure you stick to simple words and don’t deviate from these words. Trying to teach your bird a complete sentence just isn’t going to work at this point, you need individual words to succeed. Possible examples include their name, or something commonly used like “hello”. Now that you have chosen your words, it’s all about saying them as much as possible to your bird. Make sure the bird is directly in front of you, so they don’t just hear what you are saying, but also see the words come out of your lips as well. This is the imitation element of learning to talk. Additionally, and we’ve mentioned consistency in relation to the types of words which are used, make sure you use the same expressions when you say these words. With each correct word that your bird says, remember to issue a reward to him. You should create a daily routine surrounding your teaching. All it takes is a couple of sessions of up to 10 minutes per day, although be aware that the learning process doesn’t usually take days to master. Instead, be prepared to wait around for months in some cases before you hear your bird talk back to you. You can also rely on other visual aids to help you along your way. We’re mainly referring to YouTube videos here and these can be invaluable in your quest to getting your bird to talk to you. It almost sounds ridiculous, but some birds have the ability to throw some shapes as well. Again, it’s not going to be possible with every type out there, but if you can follow the steps below you might just be able to extract a few dance moves from your pet bird. We’ve already talked about the importance of a consistent training routine, and this couldn’t be more important when it comes to teaching your pet bird to dance. You need to find a flat suitable space, and always train him in the area. Most owners find that something like a flat bench works the best. Next, it’s all about the music. As strange as it may sound, birds do have musical preferences. Generally, the faster the better although you should adopt a trial-and-error approach to see which routine he responds to the best. You are likely to know relatively quickly if your bird likes a type of music, so keep an eye out for any sudden changes in behavior. We’re now onto arguably the most enjoyable step of all. Now is the time to show of you dance moves, in the hope that your bird will imitate you and start to copy himself. Like with all of the tasks we have spoken about, it’s important to reward anything positive you see at this point. It could be said that this is one of the more useful tricks you can turn to and if you can toilet train your bird, you will have immediately made life much easier. Here are the steps you need to follow to achieve this. Firstly, you need to make sure you know and understand your bird’s habits. Find out when he goes to the toilet now, how often and where he does it. You should also be looking for any signs that he displays before the act, with a change in posture, various noises, facial expressions, head movements and even the ruffling of feathers being common ones that are displayed. As a rule of thumb, a lot of birds will go to the toilet every 5-15 minutes, so the window is pretty small anyway. This “analysis” period can take a few days. Find a “toilet area” for your bird; the area you want them to use when they go to the toilet. Like with everything we’ve discussed, consistency is key here. This is arguably the hardest and most frustrating step of all. Take your bird to the area you have chosen and simply wait. If he doesn’t go the toilet after a few minutes, move him away and try again a few minutes later. If he does go, you need to heap praise onto him and use treats as a reward. Unfortunately, this is something that can take weeks to master, and there will be a lot of frustrating minutes! Repeat the above until your bird has learned the process. It will take time, but it will make life much more pleasant for the two of you. Dogs are renowned for the “sit” command and in the case of birds, this stretches to “stepping up”. 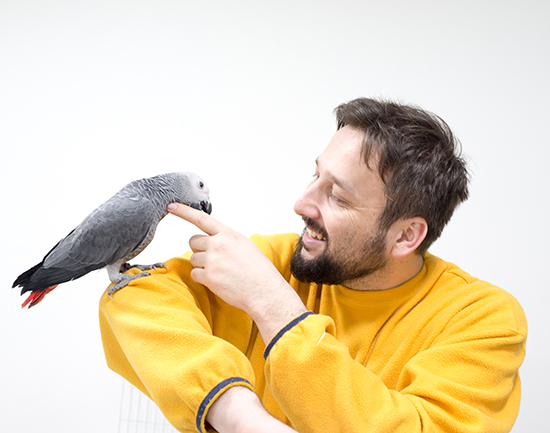 In short, this is a trick where your bird will step up onto your hand and whilst it may sound simple in comparison to some of the other practices we have discussed, it actually takes quite a while to master. Familiarity is the first stage of this task. Your bird has to be comfortable with his surroundings, as well as your presence. It means that it’s unlikely to garner much success for new birds who are not yet used to their new environment. You’ll have to spend maximum time with your bird during this phase in a bid to get him to understand your voice. You should now start to move towards the cage, keeping a close eye on your bird. If he doesn’t retreat, open his cage and offer your hand to her. At this stage it is completely normal for the bird to get scared, particularly if they are young, so don’t give up if you come across this behavior. Unfortunately, this is one of the longest parts of the training and it can take days to master. Over time, once he gets used to your hand, you can progress to a perch. Take the perch and move it towards her, pressing it towards his tummy. It’s at this point you need to issue the command, either “up” or “step up”. Over time your bird will start to learn that the chosen phrase is associated with the stepping up action, although make sure you stick to the same phrase on all occasions. Once he has mastered stepping up onto the perch, put your finger on the perch. The aim of this is to get him to step up onto your finger. This should be a lot quicker to master than the initial movement and once he has managed this, you should practice it without the perch being there. All of the above has so far occurred in the cage. Now, you need to practice it outside of it. It goes without saying that you’ll need to secure the environment at this point and make sure all doors and windows are closed. Use the same approach as what we have discussed, although hopefully this time the process should be much quicker.